Pièces détachées pour baignoires balnéo et cabines de douche. FRANCEPOOL – BALNEO offers individuals and professionals, troubleshooting and online sales of various spare parts for whirlpool baths of origin, or can substitute for brands SIREM - ASD - EMBRUNS - EMBRUNS 2 - STRATOS - ROLEX - NEOMEDIAM - JACOB DELAFON - AQUAMARINE - APAL - ALLIA - HYDRO AZUL - TECHNOPLAST - POLYROC - SANITEC - SWISSPOOL - PANDA - XWATER - CAP BLUE - ESPAIS AQUATICS - AQUAMASS - MASSOR - BANACRIL - FAS - LAITROGE - ORIANE - ALLIBERT - KOLLER - HOESCH - JEDO - TECHNIQUE ET SEDUCTION - TES - TES HYDRO - TSB - SODALEC - SANINDUSA - SUCAL - SELLES etc. . .
You can consult or download our factsheets, instructions on FAQ. Our team of specialists recognized in the world of hydromassage, is at your disposal from Monday to Friday from 9:00 to 12:00 and from 14:00 to 18:00 at 01-39-31-00-52. Suction strainer in ABS, for 50 mm tube to be glued. Equipped with a water pump safety valve in case of obstruction. Clipped and removable trim for easy maintenance. Pneumatic knob for starting or stopping an engine equipped with a pneumatic contactor. Adjustment of the air intake in the water circuit by the action of the venturi button. Also called presostat ) Linked to a pneumatic button, they allow to start or stop a WATER pump or a blower. 2 pneumatic contactors and 2 different functions. - ON / OFF or pulse. 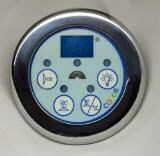 Connected to the electronic card, this device prevents the operation of the whirlpool systems in case of absence or insufficient level of water required in the bathtub. Some are preset at the factory. 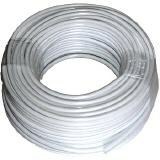 Shower hose for installation on the edge of the bathtub or tiled floor with recessed suport. 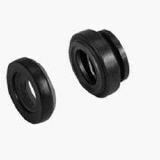 Sealing inserts (or SPI seal) for SIREM pumps - Series H - K - L, isolate the hydraulic unit (suction flange, impeller, discharge flange) from the motor. It is advisable in case of significant deterioration of the packing to also change the turbine. Air jets for bath tubs and hubcaps. Body in unalterable ABS. Chrome or white front. O-ring seal or silicone dish. Balls anti return. Diffusion of the bubbles through the 7 holes of the hubcap and laterally. Different diameters and thread lengths are available. 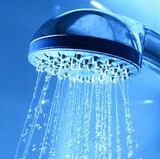 WATER / AIR jets in ABS for whirlpool baths. Front facades, chrome or white. Adjustable models, adjustable and adjustable models in flow. To stick or to crimp. 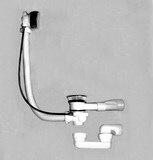 These complete electronic replacement kits for whirlpool tubs, allow you to equip your bathtub, replace a faulty system or not found. The air distributor or nanny, is the interface between the air motor and air jets.16 or 32 outlets clogged, to release with a drill of 4 mm according to your needs. To be cuffed and glued on a 32 mm tube. Outputs for quick coupling 8mm diameter. SIREM - ASD - KOLLER whirlpool pumps: Polypropylene pump body. 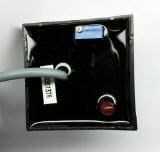 Capacitor integrated in the terminal box. Electronically or pneumatically controlled. Patented turbine (more flow with less consumption). Single-phase, bi-speeds, multi-speed, three-phase .. 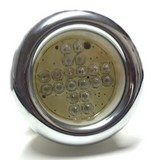 The heater, allows heating and maintaining the temperature of the bath water. Equipped with a graduated adjustable thermostat and built-in thermal protection. Spots chromothérapie à led's. Forte luminosité. Couleurs de base : BLEU - ROUGE - JAUNE - VERT. Fondue enchainée des couleurs. Pose sur la couleur de son choix en fonction de la version électronique de votre carte. They provide access to primary and secondary functions such as FITNESS - TONIC - RELAX programs. Tubes and pipes to be glued or nested for air jets, pneumatic buttons, pneumatic contactors, pumps, blowers, from 3 to 50 mm. Emptying and suctioning of the WATER pump through the spa drain. Various spare parts for whirlpool baths. Disinfectant and degreasing action product. Based on active oxygen and silver. For all Balneo systems. BALNEO MILK from CAMYLLE laboratories. 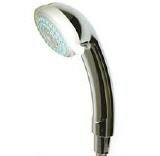 An emulsion of essential oils 100% pure and natural to make the balneo bath the instrument of a real cure of well being. 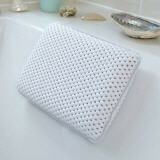 Relax in your bathtub with this luxury pillow and extend the bathing break.